You are browsing the archive for Aviation Museum of Kentucky. Willa Brown Chappell (1906-1992), a native of Glasgow in Barren County, was the first African-American woman to be licensed as a private pilot in the United States. This was in 1937; in 1943, she was the first women to hold both an aviation mechanic’s and commercial pilot license. She went on to co-found the National Airmen’s Association of America. Thisorganization promoted interest in aviation and supported pilot training positions for black aviation cadets. As a director of a racially segregated flight school in Chicago, Chappell participated in the training of more than 200 student pilots that later became members of the Tuskegee Airmen. Chappell was recognized in 2002 as one of Women in Aviation’s 100 Most Influential Women in Aviation and Aerospace. See also her picture and bio at Black Wings. No one legally learns to fly in the United States without an instructor pilot. Two Kentucky women are outstanding in this category of The Instructors. Evelyn Bryan Johnson was born in Corbin and is better known as “Mama Bird”. She is a Federal Aviation Administration Flight Instructor and an FAA Flight Examiner. Others hold these ratings like Johnson, but none match her 57,000 flight hours. The number of pilot check flights she has conducted number close to 10,000 total. 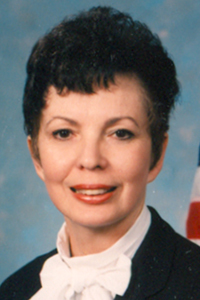 Johnson has been recognized repeatedly for her contributions to general aviation. Many pilots flying and training other pilots today had their initial training experience or “check ride” with Mama Bird Johnson. See more in the Evelyn Bryan Johnson Papers, 1930-2002 collection in the Archives of Appalachia, East Tennessee State University, Johnson City, TN; and, George Prince, “Mama Bird; Biography of Evelyn Bryan Johnson, A Flight Instructor” (Mayfield Printing, 1994); and “Your Stories: Mama Bird Evelyn Johnson,” a newsclip from WBIR TV, November 24, 2010. Sheri Coin Marshall The second instructor overcame the disability of a right arm amputation in childhood to become one of Kentucky’s most respected pilots. Shari Coin Marshall of Paducah in McCracken County is a veteran flight instructor and received the 1998 Instructor of the Year Award for the southern region of the Federal Aviation Administration. Marshall is qualified as an airline pilot and serves as a flight instructor for the physically impaired. Not held back by her impairment, Marshall has also written One Can Do It, a book on dealing with such limitations. She accomplished all this and raised two daughters.